Not to be left behind: The start of the 1km walk for the Under-12 age group. IT WAS a sweet double victory for Swede Christer Ander Axel Svensson and Malaysia’s Norliana Mohd Rusni in the Putrajaya International 12-hour walk at Dataran Putrajaya recently. The 43-year-old Svensson, making his debut in the event, struck gold in the men’s 50km and 12-hour walk in the competition. Svensson, a lecturer by profession, completed the gruelling 50km distance in a time of 5’24:13. Malaysia’s Mohd Rahman Abu Bakar was second on 5’40:12 while another Malaysian Mohd Khairi Ahmad settled for the third spot on 5’58:53. Svensson, who had represented Sweden in three World Cup walking championships, was consistent throughout the 12-hour walk and hit a massive 105 laps. Mohd Rahman could only complete 95 laps and finished second. Holland’s Frans Leutens was third on 92 laps. Step by step: Ho Yuen Loong (right) and Singapore’s Joshua Lin Lu having a chat while walking. Svensson said he was happy to strike gold in the championships. “But I had difficulties in adapting to the weather conditions here. You know it’s winter in Sweden. But the feeling is good to be the champion,’’ said Svensson. 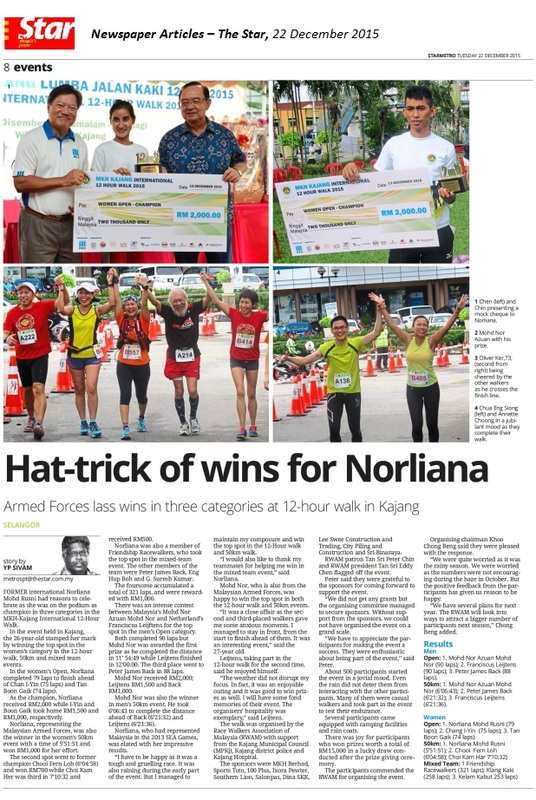 Norliana, who is expected to represent Malaysia in next year’s SEA Games in Myanmar, won the 12-hour walk with 92 laps. In second place was Loh Chooi Fern who recorded 86 laps and Norazilah Osman finished third (82 laps). Norliana, a full-time trainee with the National Sports Council (NSC), was also impressive in the 50km. She completed the distance in a time of 5’50:16. Chooi Fern was second on 6’07:03 and the third spot went to Norazilah with a time of 6’57:40. The championships was organised by the Race Walkers Association of Malaysia (RWAM) with support from the Putrajaya Corporation, Youth and Sports Ministry, Tourism Ministry, YEOS, Delfi Marketing, Southern Lion, Great Esthetics, Lee Swee Construction and Trading, Bina SKK and Milo. The organisers also had a 1km walk for the Under-12 age group. About 100 participants took part in both the boys and girls categories. The top five finishers in each category were presented with hampers from Milo. Full of stamina: Norliana flanked by Chooi Fern (left) and Norazilah with their cash prizes. RWAM president Datuk Eddy Chen said they were grateful to sponsors and supporters for making the championships a success. “The maximum 1,200 participants, including about 60 foreigners from 13 countries, took part in the championships. “Despite the presence of some established foreign participants, the Malaysians gave a good account. Our walkers had shown tremendous progress over the years. “Malaysians won the top three spots in the women’s category. Norliana has shown Malaysian women have the talents to do well in high demanding competitions. She should be given proper exposure to shoulder Malaysia’s challenge in international events,’’ said Eddy. RWAM patron Datuk Seri Peter Chin, who was also present at the prize-giving ceremony, commended the participants for their commitment and determination. “We would like to see a Malaysian making his or her presence felt in the 2015 Asian Games. “The RWAM is committed towards the promotion and development of race walking in Malaysia,’’ said Peter. PPj president Tan Sri Aseh Che Mat said they would like to be RWAM’s partner in hosting the championships. “We are keen to work towards making the championships an exciting and entertaining one. PPj will provide all the assistance for the event annually,’’ said Aseh. The RWAM and PPj also announced the dates for next year’s Putrajaya International 12-Hour Walk. It will be held at Dataran Putrajaya on Dec 14-15. Aseh said they were making an early announcement to give the participants ample time to prepare for the event. “The foreign participants can also plan ahead,’’ added Aseh. 50km: 1. Christer Ander Axel Svensson 5’24:13; 2. Mohd Rahman Abu Bakar 5’40:12; 3. Mohd Khairi Ahmad 5’58:53. 12-Hour walk: 1. Christer Anders Axel Svensson 105 laps; 2. Mohd Rahman Abu Bakar 95 laps; 3. Frans Leutens 92 laps. 50km: 1. Norliana Mohd Rusni 5’50:16; 2. Loh Chooi Fern 6’07:03; 3. Norazilah Osman 6’57:40. 12-Hour walk: 1. Norliana Mohd Rusni 92 laps; 2. Loh Chooi Fern 86 laps; 3. Norazilah Osman 82 laps. FOREIGN participants from eight countries have registered for the Putrajaya International 12-Hour Walk at Dataran Putrajaya on Dec 8-9. Race Walkers Association of Malaysia (RWAM) president Datuk Eddy Chen said they were pleased with the response from the foreign participants. “The participants are from Hong Kong, Singapore, Germany, Sweden, France, India, Japan and Saudi Arabia. The response has been overwhelming as about 900 participants have signed up. This is the third edition of the 12-Hour walk. The last two were held in Malacca. Much needed: Chen (centre) with the sponsors’ representatives. “But this year, we are joining forces with Perbadanan Putrajaya, who have been supportive of our vision to groom walkers for the nation. “The event will be an excellent platform for Malaysian walkers to gain exposure against an international field,” said Chen after the sponsorship ceremony. The sponsors are Yeo Hiap Seng, Delfi Marketing, Southern Lion, Great Esthetics, Lee Swee Construction and Trading and Bina Skk. Tourism Malaysia, the Youth and Sports Ministry and the Federal Territory Amateur Athletics Association (FTAAA) are also supporting the event. The RWAM are actively promoting walking as a sport as well as healthy lifestyle. Every year, they organised a three- leg junior development programme and also coaching clinics in schools. Chen said they would like to play a role in the development of walkers in Malaysia. “We want to see Malaysia win honours in international competitions. 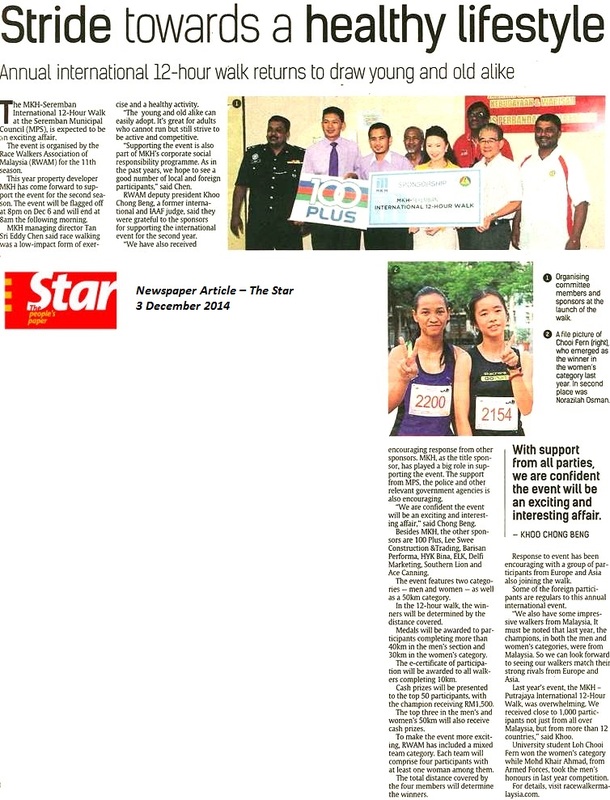 “We are pleased that several walkers from our programmes had represented their states in the Malaysia Games in Kuantan. “But we are working towards grooming walkers to be winners in the Asian Games and other competitions,” he said. There will be two categories — men and women — and the top 50 participants who cover the longest distance will receive cash prizes. The champions in both categories will receive RM1,500 each. The organisers are also offering cash incentives to the top three participants completing the 50km in both the men and women’s categories. Chen said they were offering a total cash of RM21,000 as prizes to the winners. “We are expecting about 1,200 participants to register for the championships,” said Chen. For more information, log on to www.racewalkermalaysia.com or call 019-9345106.
INTERNATIONAL walkers Nor–liana Muhd Husni and Lo Choon Sieng dominated the first leg of the Race Walkers Association of Malaysia (RWAM) junior development programme circuit at Tasik Titiwangsa in Kuala Lumpur recently. Norliana, who represented Malaysia in last year’s SEA Games in Indonesia, was the winner in the women’s Open category while Choon Sieng won the gold medal in the men’s Open category. Norliana completed the 3,000m event in 14:51 to win the gold medal. National junior Song Gie Chee was second on 14:58 while Lee Shew Keng was a distant third on 19:05. Lo, the SEA Games gold medallist, was impressive in the men’s Open 10,000m and finished in 43:35 ahead of Muhammad Khairk Harith Harun (44:10) and T. Dhiban Raj (48:47). However, the most impressive participant was Elena Goh. The youngster, a student at the Bukit Jalil Sports School (BJSS), won the gold medal in the girls’ Under-18 category. She clocked 14:52 followed by Pua Ling En (16:35) and Yap Hui Shan (18:08). RWAM were pleased with the participation of juniors in the Under-12 age group for both boys and girls. Former international R. Mogan, currently attached to the Negri Sembilan State Sports Council, said the high number of participants in the Under-12 age group was a good sign. “The future is in the hands of the juniors. I was impressed by them. They have the techniques and should participate in more competitions,” said Mogan. The next leg of the circuit will be at Tasik Titiwangsa on June 25. 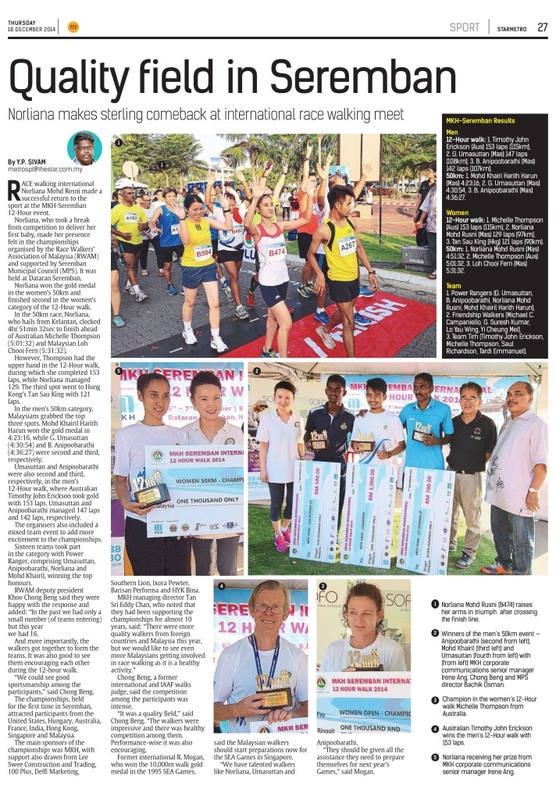 NATIONAL walkers T. Dhiban Raj and Norliana Muhd Rusni stole the show at the Race Walkers Association of Malaysia (RWAM) second junior development programme at Tasik Titiwangsa in Kuala Lumpur recently. Dhiban clocked an impressive 46:32 to finish the race almost two laps ahead of Mohd Aziz Anuar (50:54) and B. Anipoobarathi (53:25). In the women’s category, Norliana, who hails from Kelantan, started in an impressive mode and led all the way to complete the event in 14:38. Alena Goh Ling Yin, a student of Bukit Jalil Sports School (BJSS) was a distant second on 16:08 followed by Song Gie Chee (16:26). The programme was organised by the RWAM, with support from Milo, as part of the junior development programme. 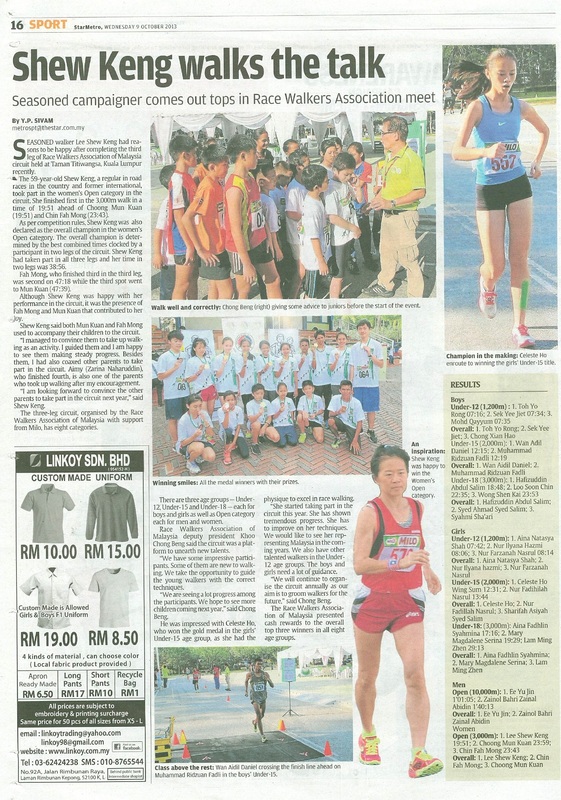 RWAM secretary Yap Woon How said the programme was to encourage juniors to be active in race walking. “We are encouraged with the response from the students. We have very good response from the boys and girls in the Under-12 and Under-15 age groups. “We hope to see these walkers continue their training and also participate in local age group competitions. Later this year, we will be organising another competition. We expect another encouraging participation,” said Woon How. Former international R. Mogan, who is now coaching the Negri Sembilan juniors, said it was time for more walking events to be held in the country. “The RWAM should be praised for their efforts in the promoting race walking among juniors. But the senior walkers will be happy if the 20,000m event is also included in the programme. “Our walkers will be able to gauge their progress for international competitions like the SEA Games,” said Mogan. 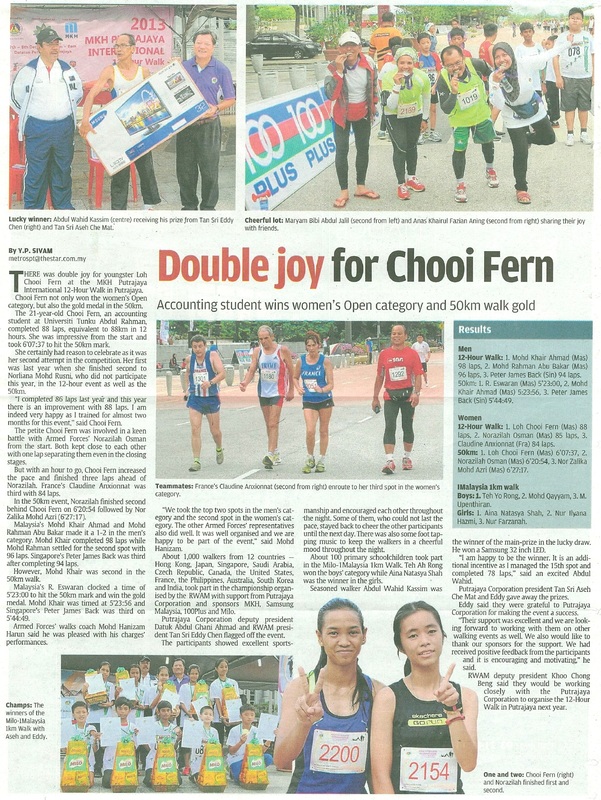 NATIONAL juniors T. Dhiban Raj and Elena Goh are delighted with their progress in race walking. And the duo have been given the privilege to represent Malaysia in the MTR Hong Kong Race Walking championships in Hong Kong on April 10. The Hong Kong Amateur Athletic Association (HKAAA) had extended an invitation to the Race Walkers Association of Malaysia (RWAM). The RWAM had picked Dhiban and Elena to take part in the 10km event. Current international Teoh Boon Lim will accompany the duo as the coach and team manager. Boon Lim is Elena’s coach while former international R. Morgan is guiding Dhiban. The RWAM president Datuk Eddy said they had picked Dhiban and Elena for the championships based on the walkers’ progress last season. “We are grateful to the HKAAA for inviting us for the championships. They had offered a package with air tickets, accommodation, allowance and internal transportation. Both Dhiban and Elena have clocked impressive times. “We hope to see them return with new personal bests,’’ said Eddy. The 21-year-old Dhiban has a personal best of 44:55 clocked en route to winning the gold medal in the Milo-Malaysian Schools Sports Council (MSSM) championships last year. Dhiban said he was thankful to the RWAM for giving him the opportunity to take part in Hong Kong. “I am well prepared. The championships will be an ideal platform for me to gain exposure against the field,’’ said Dhiban after a training session at the National Sports Council (NSC) training centre in Bukit Jalil. Elena is a Form Three student at the Bukit Jalil Sports School (BJSS) and is hailed as a champion in the making. She has a personal best of 54:26 clocked during the Malaysian Open last year. For Elena, the Hong Kong event will be her second foreign competition this year. Her first was the Little Athletics championships in Perth, Australia last month. She won the gold medals in the 1,500m walk and 1,500m. Boon Lim, an athletic coach at the BJSS, said both Dhiban and Elena were in good form and should be able to clock respectable times in Hong Kong. ALENA GOH was the most impressive participant in the first junior development walking circuit, organised by the Race Walkers Association of Malaysia (RWAM), at the Kuala Lumpur Football Stadium in Bandar Tun Razak, Kuala Lumpur recently. The Federal Territory Amateur Athletics Association (FTAAA) secretary S. Vegiyathuman, who was present at the stadium, was pleased with Alena’s walking techniques. “She has the potential to be an accomplished walker. We are keen to take her under our wings and groom her for the future,’’ said Vegiyathuman. High performance: Alena clocked an impressive time on the 3,000m walk. Alena took part in the women’s Open category and completed the 3,000m walk in an impressive time of 15:33.00s while Song Gie Chee was second on 16:06.00s followed by Seah Beng Choo 18:13.00s. About 50 participants, including a group from Singapore, took part in the first leg of the circuit. 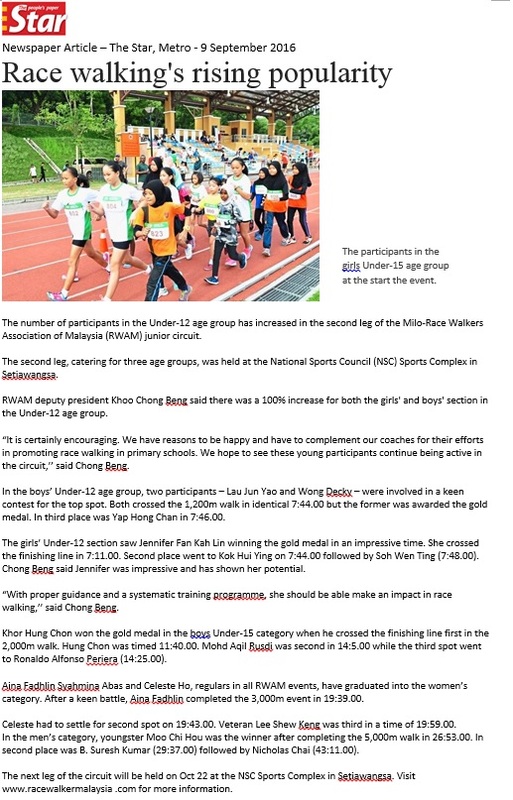 RWAM deputy president Khoo Chong Beng, a former international, said the circuit was an effort by them to encourage juniors to take up walking as a sport. “The first leg drew some interesting participants. We are pleased with the response for the Under-12 age groups for both boys and girls. We hope the number will increase for the second leg,” said Chong Beng. The second leg will be held on June 5 while the third will be on Sept 25. Both the legs will be at the Kuala Lumpur Football Stadium in Bandar Tun Razak. The RWAM is also offering cash incentive to the top three participants in each category after the third leg. To be eligible for the incentive a participant must have taken part in , at least, two legs. The top three participants with the best time will be rewarded with cash. Chong Beng said they had also invited participants from the Asean countries to be part of the circuit. “Singapore came with a group of walkers but Indonesia and Thailand could not make it. The idea was to create a circuit involving the four countries. Maybe we are a bit too ambitious but the presence of the walkers from Singapore is encouraging. “We expect Singapore to organise a similar competition and RWAM will be willing to send a team,’’ said Chong Beng. Under-15 (2,000m): 1. Mohd Hatis Ibrahim 12:55.00; 2. Mohd Nisbah Mohd Azahar 13:46.00; 3. Cheng En-Zhi Eliel 15:55.00. Under-18 (3,000m): 1. Muhamad Akram Ismail 17:33.00; Cheng Jun Wen 19:29.00. Under-12 (1,200m): Nur Fadihilah Nasrul 8:22.00; 2. Nur Farzanah Nasrul 9:33.00; 3. Aishah Alissa 10:15.00. Men Open (10,000m): 1, Mohd Afiz Firdaus Kamaruzaman 52:50.00; 2. Mohd Azizi Anuar 54:52.00; 3. Edmund Sim Soon Chye 55:34.00. NEGRI Sembilan’s T. Dhiban Raj clocked a personal best en route to winning the men’s Open 5,000m walk in the third and final leg of the Race Walkers Association of Malaysia (RWAM) junior development programme at the Kuala Lumpur Football Stadium in Bandar Tun Razak, <?<span>Kuala Lumpur recently. Dhiban, who won the 20km walk gold medal in the Malaysia Games (Sukma) in Malacca in June, was timed 22:19 in the event. His time was better than his previous best of 22:39. His coach R. Mogan, the winner of the 10,000m walk gold medal in the Chiangmai SEA Games in 1995, was delighted with his protege’s progress in recent months.Dhiban was the winner in the 20km walk in the Armed Forces athletics championships in Kuala Lumpur two weeks agoby clocking a personal best of 1’34:00. <?</SPAN>Close tussle: R.Eswaran (in blue) and Afiz Firdaus Kamarazaman involved in a keen battle for the gold medal in the boys’ Under-15 age group. “I am working towards preparing him for next year’s SEA Games in Indonesia. Based on his tremendous progress, I am confident he will be in a good position to stake a claim to represent Malaysia in the SEA Games,’’ said Mogan. Mogan was also pleased with his other proteges’ performances in the championships. They are R. Eswaran, B. Anipoobarathi and Hanubarathi. Eswaran was the winner in the boys’ Under-15 category when he completed the 2,000m walk in 9:18. He was also the overall champion. Anipoobarathi and Hanubara-thi finished second and third in the overall standing in the boys’ Under-18 3,000m walk. 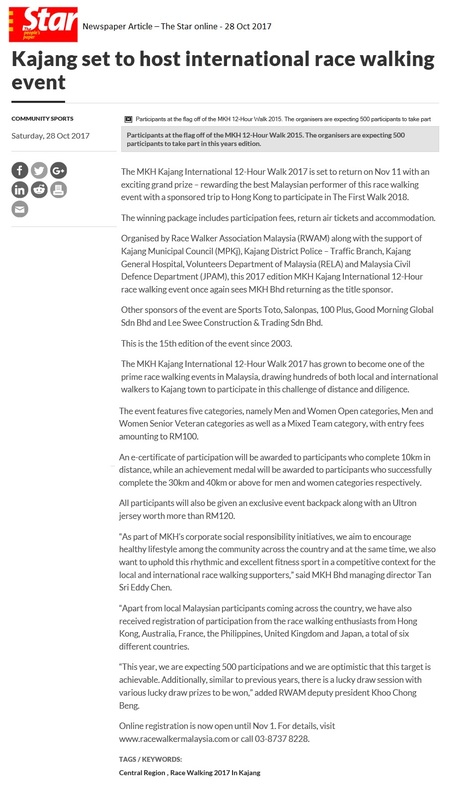 The RWAM, headed by Datuk Eddy Chen, had initiated the three-leg circuit as a platform for Malaysian walkers to improve. He is also happy with the active participation of former internationals including Mogan, Jagjit Singh, Teoh Boon Lim and B. Thirukumaran playing an active role in the development of race walking at grassroots. The championships also saw the active participation of SJK (C) Lai Meng, Kuala Lumpur in the Under-12 age group. About 30 participants from the school made their presence felt in both the boys and girls’ 1,200m events. Making her move: Nur Fadihilah Nasrul (left) overtakes Muhammad Mirzan Johor Nadim Johor (centre) and Rahmud Budiman Iria. Men: 1. T. Dhiban Raj 22:19; 2. Muhammad Khairk Harith Harun 23:41; 3. Mohd Azize Anuar 26:36. Under-15: 1. R. Eswaran 9:16; 2. Afiz Firdaus Kamarazaman 9:18; 3. S. Puwaneswaran 11:37. Under-15: 1. Elena Goh Ling Yin 10:58; 2. Aina Fadlin Syahmina Abas 12:26; 3. How Leey Shiaan 14:40. Under-18: 1. Nur Aisyah Ahmat 16:21; 2. Loh Chooi Feim 17:51; 3. Yap Hui Shan 20:52. 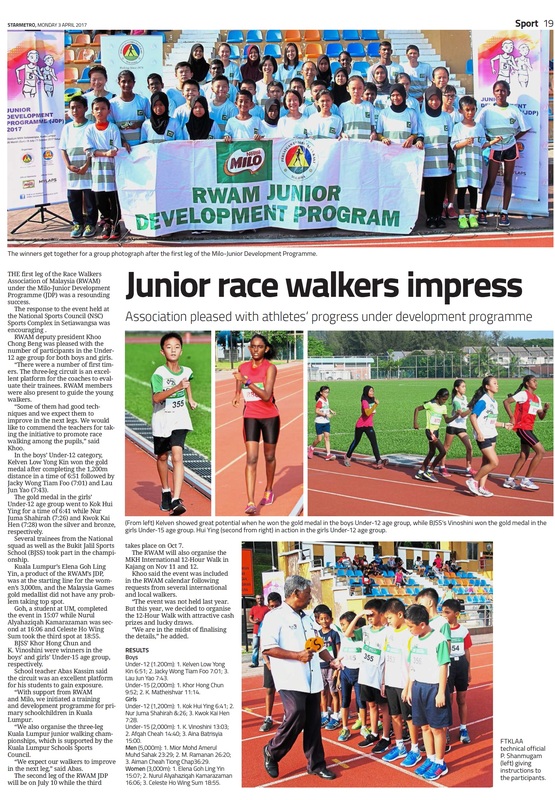 The Race Walkers Association of Malaysia (RWAM) junior development programme circuit has gained momentum. The number of the participants for the second leg of the circuit at the Kuala Lumpur Football Stadium in Bandar Tun Razak has increased. RWAM deputy president Khoo Chong Beng said they had about 100 participants for the event. “We are encouraged by the response and would like to thank the teachers and schools for the support. We have created a platform for juniors to be involved in competitions. The different age groups make the circuit an interesting affair,’’ said Chong Beng. Cream of the crop: The top three finishers with their medals in their various categories. The circuit has four categories — Under-12, Under-15, Under-18 and Open — for both boys and girls. Several seasoned walkers, preparing for the Malaysia Games (Sukma) in Malacca, made their presence felt in the event. Negri Sembilan’s T. Dhiban Raj, sisters Norrusuhila Mohd Rusni and Norliana Mohd Rusni, Song Gie Chee and R. Eswaran were among the notable participants. Dhiban won the gold medal in the boys’ Open 5,000m in a time of 24:06 followed by Muhammad Khairk Harith Harun (24:11) and Mohd Shaferi Roslan (26:16). Norliana, who was fourth in the Laos SEA Games in 2009, was the winner in the girls’ Open 3,000m. The 20-year-old Norliana clocked 15:24 while teammate Song Gie Chee was second on 15:31 followed by Siti Harnish (16:48. Norrusuhila cloked 15:47 to win the gold medal in the girls’ Under-18 3,000m. In second place was Loh Chooi Fei on 17:35 and Yap Hui Shan was third in 21:06. Young walkers: Gamal Arif Fikri Gamal Nasirudin (left) and Muhammad Arif Affan Abu Bakar leading the pack in the boys’ Under-12 age group. The Federal Territory Amateur Athletics Association (FTAAA) coaching chairman S. Arunandy praised the RWAM for initiating the programme. “I am pleased with the junior participants. With more similar competitions, we will be able to groom walkers for the state and country. “More schools should take part in this circuit. I am sure the students will benefit as the competition is quite interesting. “The young boys and girls will be able to gain valuable exposure,’’ said Arunandy. The final leg of the circuit will be in September. Under-12 (1,200m): 1. Muhammad Mirzan Johor Nadim Johor 8:23; 2. Rahmad Budiman irja 8:23; 3. Bernard Lee Jun Yi 9:11. Under-15 (2,000m): 1. R. Eswaran 9:40; 2. S. Puwaneswaran 11:03; 3. Amirudin Syah Ahmad Rushdi 12:08. Under-18 (3,000m): 1. B. Anipoobarathi 14:59; 2. N. Satyaraj 15:17; 3. B. Hanubarathi 15:24. Under-12 (1,200m): 1. Nur Fadihilah Nasrul 8:38; 2. Belinda Ng Xin Yi 9:13; 3. Sazlin Syaihudin 9:19. Under-15 (2,000m): 1. Elena Goh Ling Yin 10:30; 2. Sawin Kaur 12:37; 3. Aina Fadlin Syahmina Abas 13:23. FORMER international R. Mogan, who is still the proud holder of the national men’s 10,000m walk record, is on a mission to groom walkers for the state and country. Mogan, whose time of 43:03.24, set in 1997, remains unsurpassed, is now coaching a group a youngsters. As a full-time coach employed by the Negri Sembilan State Sports Council (MSNS), Mogan has about 30 juniors under his wing. The 35-year-old Mogan, who won the 10km gold medal in the Chiangmai SEA Games in 1995, is in charge of the athletics centre of excellence based at SMK Bukit Merah in Seremban. Students from three schools — SMK Bukit Merah, SMK Anglo Chinese School and SMK Mambau — attend training five days a week. Several athletes from the programme have made an impact in local competitions. The notable ones are T. Dhipan Raj, T. Easwaran, B. Anubarathi, S. Sivasangkaran and B. Thevananth. Dhipan Raj, Easwaran and Anubarathi are walkers while Sivasangkaran and Thevananth are runners. Dhipan Raj, who is awaiting his SPM results, won the boys’ Under-18 gold medal in the 10,000m walk while Easwaran was the winner of the boys’ Under-15 5,000m walk in the Milo–Malaysian Schools Sports Council (MSSM) athletics championships this year. Anubarathi also made his presence felt in the boys’ 10,000m walk by finishing fourth. Dhipan Raj has a personal best of 48.18 in the 10,000m walk and 1’46.00 in the 20km walk. According to Mogan, Dhipan Raj has shown a lot of progress in the last two years. “He is capable of clocking faster times. He has been earmarked to lead Negri Sembilan’s challenge in the Sukma in Malacca. We have about six months to work on his shortcomings, and we are confident he will be able not only to clock a personal best but also win a gold medal in the Sukma,” Mogan said. Dhipan Raj said he would be taking part in a series of competitions to prepare for the Sukma. The events will be the district schools meet as well as the Negri Sembilan Schools athletics championships. “I will be getting exposure in the Open championships, so I will be able to gauge my progress against the senior walkers,” Dhipan Raj said. As for the runners in the programme, Sivasangkaran is an accomplished athlete in the 800m and 1,500m while Thevananth has clocked impressive times in the 400m and 800m. Sivasangkaran’s personal best in the 800m and 1,500m are 2:03.00 and 4:26.00 respectively while the 17-year-old Thevananth has clocked 54.03 in the one-lap race and 2:06.00 in the 800m. Mogan, who has been actively coaching juniors for the past 12 years, said both Sivasangkaran and Thevananth had the potential of representing the country in the coming years. “Both are ambitious and dedicated in training. We should be able to gauge their progress in competitions next year,” he said. VETERAN walker B. Thirukumaran had a memorable outing at the 12-Hour Walk at Dataran Putrajaya recently. The 40-year-old Thirukuma-ran, who was taking part in the gruelling event for the first time, swept all three gold medals at stake in the men’s category in the championships. His first gold medal came when he emerged as the top participant in the 50km event. Then he continued his walk to complete the 70km walk first. However, the accolades came for his 101km effort in the 12-Hour Walk. Thirukumaran, an officer with Maybank, said he was delighted with his triumph in the 12-Hour Walk. Time out: Some even camped out for the race. “Previously, I had only taken part in the 50km walk. But this year, I was keen to venture into the 12-Hour Walk. I had trained hard and my target was about 100km. “I did not stop at any time during the 12 hours. I was quite apprehensive and did not want my concentration to be disrupted,” said an excited Thirukumaran. There was another reason for Thirukumaran, who had represented Malaysia in the SEA Games, Asian Games, Commonwealth Games and Asian championships, to smile and that was his protege L. Mathivanan’s impressive performance in the competition. The 21-year-old Mathivanan was second to Thirukumaran in all three events. Mathivanan, who is preparing for the 2010 Sukma in Malacca, said he was pleased with his results. Great effort: Thirukumaran (right) takes the lead as his protege Mathivanan keeps pace. “It was tough and I had taken a short break during the 12-hour walk. I have to thank my mentor (Thiru-kumaran ) for motivating me,” said Mathivanan, who completed 94km in the 12-hour walk. Last year’s best Malaysian finisher R. Thevendra settled for the third place in 91km. In the women’s category French-woman Kora Bouffilert was the winner when she completed 94km. Malaysia’s Yap Wai Mun was second on 83km followed by Hong Kong’s So Kit Mun with 81km. However, the loudest applause was saved for Singapore’s H. Krishnan, who, at 80, was the oldest participant in the 12-hour walk. Krishnan completed 48km and was presented with a special award by Datuk Eddy Chen, the president of the Race Walkers Association of Malaysia (RWAM). Chen said it was indeed good to witness a senior person like Krishnan coming all the way from Singapore for the event. “We hope to see him return next year,” said Chen after the prize giving ceremony. The 12-Hour Walk was organised by RWAM) with support from the Putrajaya Holdings and the Federal Territory Amateur Athletics Associa-tion (FTAAA). The sponsors for the walk were Rockport, Johnson and Johnson, Sloan’s, Proviton, Isotnic H-Two-O, Resorts World and Eagle brand. Chen said they were pleased with the response for the event as the participants had created a carnival atmosphere. “It was wonderful to see participants coming with their family members. Some of them had stayed overnight to support the participants,” Chen said. RWAM patron Datuk Seri Chin Fah Kui, who gave away the prizes to the winners, said they were looking forward to organising more walking events in Putrajaya. Women: 1. Kora Bouffilert (Fra); 2. So Kit Sum (Hkg); 3. Yap Wai Mun. Women: 1. Kora Bouffilert (Fra); 2. So Kit Mun (Hkg); 3. Kwok Chin Ha (Hkg). INTERNATIONAL B. Thirukumaran is gearing towards a new challenge in the Putrajaya International 12-Hour Walk at Boulevard Putrajaya tomorrow. The 40-year-old Thirukumaran, who has represented Malaysia in various international competitions including the SEA Games, Asian Games, Commonwealth Games and Asian championships, will be taking part in the 12-Hour walk for the first time. Last year, he finished first in the 50km category. But this weekend he has opted to venture in the 12-Hour walk. All set: Thevendra was Malaysia’s best finisher in the men’s Open event last year. “I want to try something new and the 12-Hour walk will be a challenging one,’’ said Thirukumaran after a training session at the National Sports Council (NSC) training centre in Bukit Jalil recently. The 12-Hour Walk, organised by the Race Walkers Association of Malaysia (RWAM) with support from the Putrajaya Holdings and the Federal Territory Amateur Athletics Association (FTAAA), will be flagged off at 8pm on Saturday and will end at 8am the following day. The sponsors for the walk are Rockport, Johnson and Johnson, Sloan’s, Proviton, Isotnic H-Two-O, Resorts World and Eagle brand. About 750 participants have registered for the event. There will be two categories — men and women — and the top 30 participants who cover the longest distance will receive cash prizes. The organisers are also offering cash incentives to the top three participants completing the 50km and 70km in both the men and women’s categories. Thirukumaran said he would be happy to cover about 90km in the event. “Last year, I took about five and half hours to complete 50km. So, the 90km distance is within my capabilities,’’ said Thirukumaran. Thirukumaran will have to contend with R. Thevendra, who was the best Malaysian in the men’s category last year, covering 91km. Thevendra said he would be looking forward to better his distance in this year’s event and the competition from seasoned Thirukumaran would be welcomed. Time to stretch: Thirukumaran (right) and Mathivanan warming up for a training session. “We train together. He will provide me an additional motivation to do better,’’ said Thevendra. Youngster L. Mathivanan, who is training under Thirukumaran for next year’s Sukma, is also eager to do well in the event. “I am not expecting to do anything spectacular. My aim is to gauge my progress as I am preparing for next year’s Sukma and other competitions,’’ said the 21-year-old Mathivanan. RWAM president Datuk Eddy Chen said the event would be an ideal platform for Malaysian walkers to evaluate themselves. “Our aim is to create opportunities for the walkers. “We hope to see some new talents from this event,’’ said Chen. Participants can collect their numbers and T-shirt at the Cempaka Sari Auditorium, Putrajaya Holdings from 3pm to 7pm tomorrow. THE Race Walkers Association of Malaysia (RWAM) are on course to get 750 participants for the Putrajaya International 12-Hour Walk at Boulevard Putrajaya on Dec 12. RWAM president Datuk Eddy Chen said about 650 participants had already signed up for the event being held for the second year in Putrajaya. “We are confident of hitting the target of 750 participants before the closing date. The 12-hour walk has become a popular event among Malaysians. We expect 85% of the participants to be local. Some of the foreign participants are seasoned walkers. 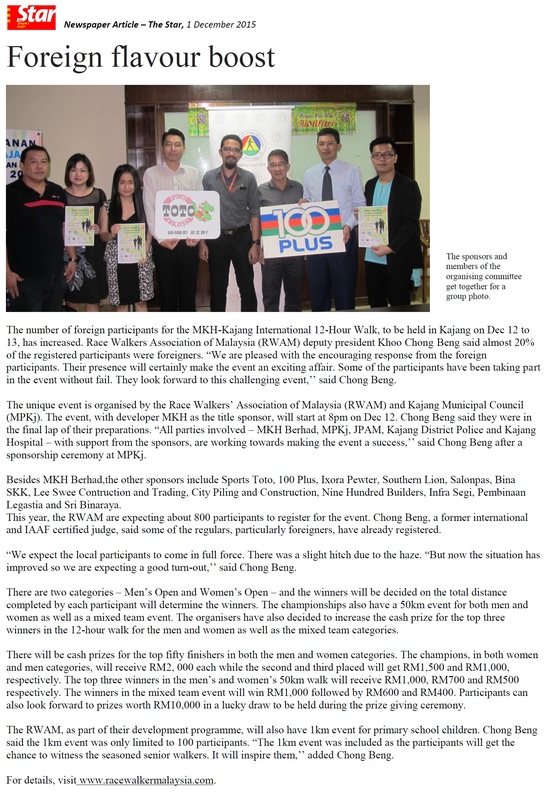 “We anticipate an exciting field for this year’s event,’’ said Chen after a sponsorship ceremony in Kuala Lumpur recently. The sponsors for the 12-hour walk are Rockport, Johnson and Johnson, Sloan’s, Proviton, Isotnic H-Two-O; Resorts World and Eagle brand. Last year, about 60 participants took part in the 12-hour walk held for the first time in Putrajaya. Last year Belgian Alexander Vandenhoe completed 94km to win the men’s Open category. He was also the winner in the 12-hour walk held in Penang in 2007. A team: Chen (third from left) and OCM secretary Datuk Sieh Kok Chi (left) with representatives from the sponsors. In the women’s category, the winner was Hong Kong’s Kwok Chik Ha with a distance of 83km. The best Malaysian in the men’s category was R. Thevendra, who completed 91km for a second spot while in the women’s category, Lim Siew Lean completed 71km to finish third. Chen said the 12-hour walk was not just a competition but very much a physical and mental challenge. “Participants must be well prepared for the event,’’ added Chen. The RWAM are organising the 12-hour walk, with support from the Putrajaya Holdings and Fedearl Territory Amateur Athletics Association (FTAAA). The event will start at 8pm on Dec 12 and end at 8am the following morning. There will be two categories — men and women — and the top 30 participants who cover the longest distance will receive cash prizes. The entry fee is RM70. For more information, visit http://racewalkermalaysia.synthasite.com or www.championchip.com.my. NEGRI Sembilan’s T. Dhiban Raj and K Eswaran continued their impressive outing in the Junior Development Programme walk circuit at the Kampong Pandan Sports Complex recently. Both won their respective events in the third and final leg of the walk organised by the Race Walkers Association of Malaysia (RWAM). In control: Dhiban Raj won gold medal in the boys Under-18 age group. Eswaran won the gold medal in the boys’ Under-15 age group. He completed the 2,800m walk event in an impressive time of 14:42. S. Puwaneswaran was second in 15:35 while R. Perimbakumar was third in 15:36. Dhiban, who has been dominating the Under-18 age group competitions this year, showed his progress by winning the gold medal in the 4,800m event. He clocked 24:47 to finish ahead of B. Anubarathi (25:50) and Syed Ibrahim Sulaiman (27:36). The RWAM deputy president Khoo Chong Beng said they were happy with the response for the circuit. “The circuit had provided a platform for juniors to gain exposure. We hope to see these juniors continue being active in race walking. 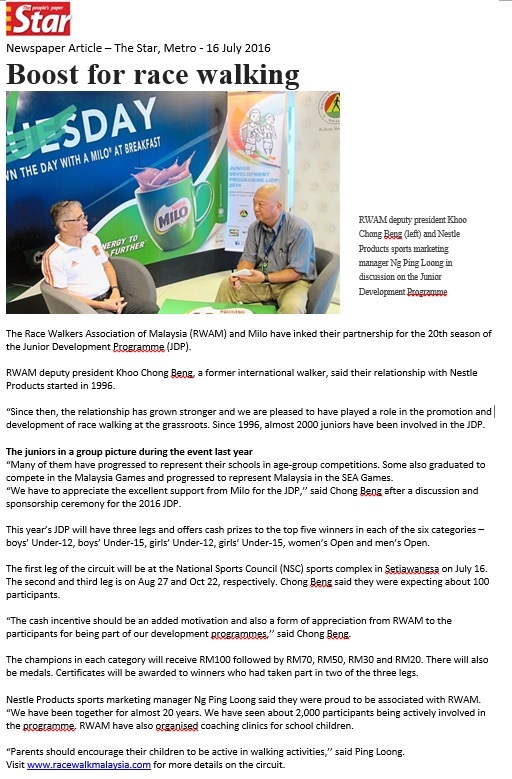 The RWAM will be organising the circuit again next year,’’ said Khoo. Meanwhile the RWAM will be organising the Putrajaya International 12-Hour walk at Dataran Putrajaya on Dec 12-13. The event, held for the second time, has six categories — individual men and women, men and women 50km and men and women 70km — will start at 10pm on Dec 12. Last year, about 500 participants, including several foreign professionals, took part in the 12-Hour walk. This year, the RWAM are expecting about 800 participants. Under-18 (4,800m): 1. T. Dhiban Raj 24:47; 2. B.Anubarathi 25:50; 3. Syed Ibrahim Sulaiman 27:36. The Race Walkers Association of Malaysia (RWAM) is convinced that it is on the right track towards grooming walkers for the country. The RWAM initiated a three-leg walk circuit this year. The first leg was held on March 22 while the second leg was at the National Sports Council (NSC) Training Centre in Bukit Jalil on July 5. The third leg, to decide the overall champions in the eight categories, will be on Oct 4. The RWAM deputy president, Khoo Chong Beng said they were impressed with the participants’ progress in the second leg. On course: Mohd Shafik (left) en route to winning the men’s Open 10km event. “The walkers clocked faster times in their respective events. The results reflect the progress the walkers have made since the first leg in March. We expect to perform better in the third leg,’’ said Khoo, who also served as the chief judge in the second leg. Negri Sembilan’s T. Dhiban Raj was one of the impressive walkers in the second leg. Dhiban, winner of the boys’ Under-18 10,000m walk in Milo-Malaysian Schools Sports Council (MSSM) championships in May, was involved in an intense battle with Muhammad Khairk Marith in the boys’ Under-18 2,800m walk. But Dhiban, who trains under former SEA Games gold medallist R. Morgan, crossed the finishing line in 12:48 to win the gold medal. Muhammad Khairk settled for the silver in 13:00 while the bronze medal went to B. Anubarati in 15:01. Closing the gap: Dhiban Raj (left) leaving Muhammad Khairk in the boys’ 2,800m event. Khoo, who had represented Malaysia in the Asian Games and Commonwealth Games, said the walkers should continue to train under their respective coaches. 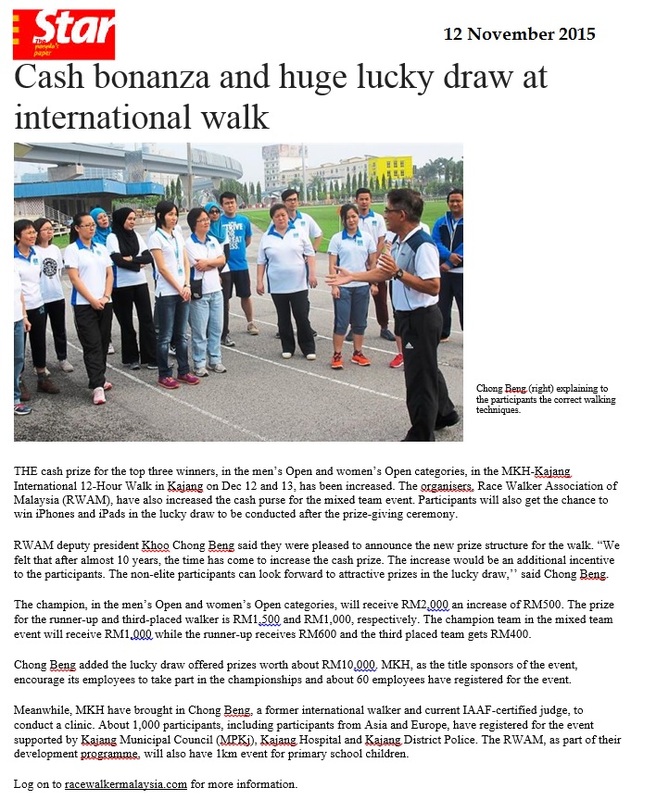 “Our walkers have all the chances to win medals in the SEA Games and Asian Games. But they have to train diligently with commitment. 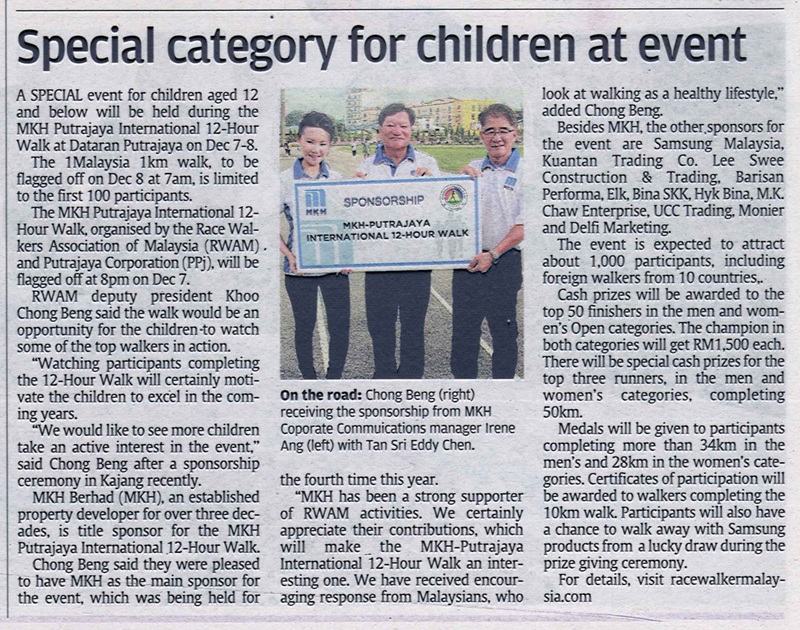 Looking at the young walkers, we should be able to groom them for the future,’’ said Khoo. Here are some blogger's website that shares thier experience during the "1st Putrajaya International 12 Hour Walk 2008". 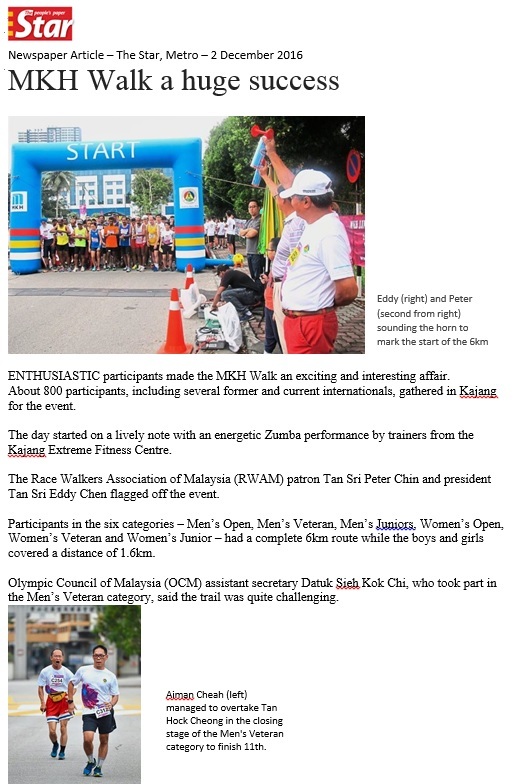 The Race Walkers' Association of Malaysia would also like to thank you for the support by publishing your comments, photos & some write up about this event. *if any of the bloggers would like to post up, please inform whyap@metrok.com.my we are willing to assisit you to add into this colum. IT was yet another triumphant outing for Belgium’s Alexander Vandenhoek and Hong Kong’s Kwok Chik Ha in the 12-Hour Walk held in Putrajaya recently. Vandenhock defended his men’s Open title in the championships while Kwok was the winner in the women’s category. It was a close battle for Vandenhock in the men’s category as Malaysia’s R. Thevendra and Ghana’s John Senanu Segbe were in an uncompromising mood and gave the defending champion some anxious moments. But Vandenhock, with experience on his side, completed 94km within 12 hours to walk away with the title. Thevendra and Segbe completed 91km each but the Malaysian finished in a faster time and was declared the runner-up. They did it: The winners posing for a group photo after the prize presentation ceremony. Kwok, who was the winner in the women’s event last year in Penang, was in fine form and completed 83km in 12 hours. Teammate So Kit Sum was second with 74km while Malaysia’s Lim Siew Lean was third on 71km. Malaysia veteran walker B. Thirukumaran was the winner in the men’s 50km event, introduced this year. The former international clocked 5’ 29:52 to finish ahead of Thevendra (6’03:24) and Bill Purves (6’47:43). In the women’s category, Kwok and So made it a 1-2 for Hong Kong. Kwok clocked 6’53:14 while So was timed 7’46:31 while Malaysia’s Teo Ah Liew was third on 8’09:42. The organisers, Race Walkers Asso-ciation of Malaysia (RWAM), had introduced the 50km event to provide Malaysians the chance to prepare for the 2010 Commonwealth Games in New Delhi. However organising secretary Khoo Chong Beng, a former international, said the times recorded by the participants in the 50km event was far from impressive. “We have to initiate more training programmes and competitions for our Malaysian participants. The RWAM is keen to organise more 50km walk events,’’ said Khoo. RWAM president Datuk Eddy Chen and Olympic Council of Malaysia (OCM) secretary Datuk Sieh Kok Chi gave away the prizes to the winners. Chen said they were happy with the response which surpassed their target of 350 participants. “A total of 508 participants had registered for the event and 448 completed the 12-hour walk. We will look into ways to make the 12-hour walk more interesting in the coming years,’’ said Chen. 3. Teo Ah Liew 8’09:42. BELGIUM’S Alexander Venderhock and Hong Kong’s Kwok Chik Ha, the men’s and women’s defending champions, have confirmed their participation in the 12-Hour walk to be held in Putrajaya on Dec 13 and 14. Venderhock and Kwok were the champions in last year’s event held in Penang. 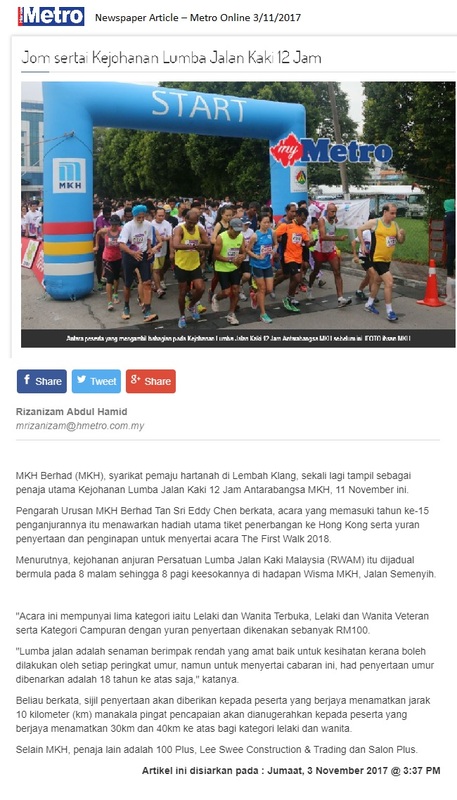 But this year, the organisers — the Race Walkers Association of Malaysia (RWAM) — have opted to stage the event in Putrajaya. Training hard: Thevendra (third from left) taking to the track at the NSC Training Centre in Bukit Jalil. The walk, starting at 8pm on Dec 13, will have two categories and there will be cash prizes for the top 30 who finish in each category. The organisers have also included a 50km event for both men and women. Coming back: Kwok will be in Putrajaya to defend her title. Organising secretary Khoo Chong Beng said response had been overwhelming and they had to stop accepting entries. “Our initial target was about 300 participants but now almost 500 had signed up for the event. “We are also pleased with the confirmation by the defending champions. Their presence will certainly make the event an exciting affair. It will be interesting if they can continue their winning streak in the event,” Khoo said. The 50km walk has been included in the event to encourage local participants to prepare for the 2010 Commonwealth Games in New Delhi. Seasoned walkers B. Thirukumaran and R. Thevandra will be making an attempt to qualify for the Commonwealth Games. Thevandra, a university student, said he was keen to make an impact in the 50km walk. “I am determined to clock an impressive time. This is the first time I am taking part in the 50km walk. I have been spending a lot of time on training and I am confident of setting a good time,” the 26-year-old said. RWAM president Datuk Eddy Chen said they had received encouraging response from foreign participants. FORMER international walker Jagjit Singh shared his experiences with students from the SMK Sultan Abdul Aziz Shah in Kajang during a coaching clinic recently. About 50 students attended the half-day coaching clinic, initiated by the Race Walkers Association of Malaysia (RWAM), in conjunction with the 12-hour walk to be held in Putrajaya on Dec 13 and14. Jagjit said he was pleased with the encouraging response from the students. Leading the way: Jagjit at the head of the pack as he puts the students through their paces. “Many of them were first timers and took some time to adapt to the techniques. But they were prepared to go through the drills. “We hope to see the students continue the training with their teachers. We have also requested the school teachers to help the students with weekly training sessions,’’ Jagjit said. Another former international, Khoo Chong Beng, was also present to give some pointers to the students. Khoo, who had represented Malaysia at the SEA Games, Asian Games and Commonwealth Games, said Malaysians had the physique to excel in walking events. Easy does it: Jagjit (second from right) showing the students how to stretch properly. “We have to nurture them from young. 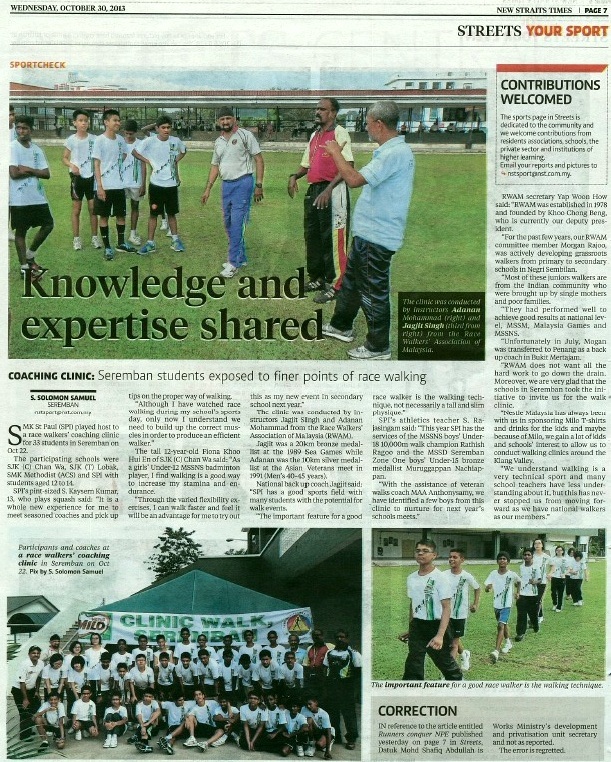 We are going to the schools to encourage students to be active in walking events,’’ Khoo said. Jagjit said he would be visiting the SMK SAAS regularly to monitor the students’ training programme. “There are a lot of promising students with potential. With proper guidance, they will be able to progress in the walking events,’’ he said. Meanwhile, the RWAM has received encouraging response for the 12-hour walk, being held for the fifth consecutive year. The past four editions were in Penang. This year, the RWAM has teamed up with Putrajaya Holdings and the Federal Territory Amateur Athletics Association (FTAAA) for the event to be held in Putrajaya. Khoo said about 250 participants had registered for the 12-hour walk. “We are expecting about 300 participants. We have also included a 50km event for both men and women. “The reason is to give our local walkers a chance to get prepared for the 2010 Asian Games and Commonwealth Games,’’ said Khoo. 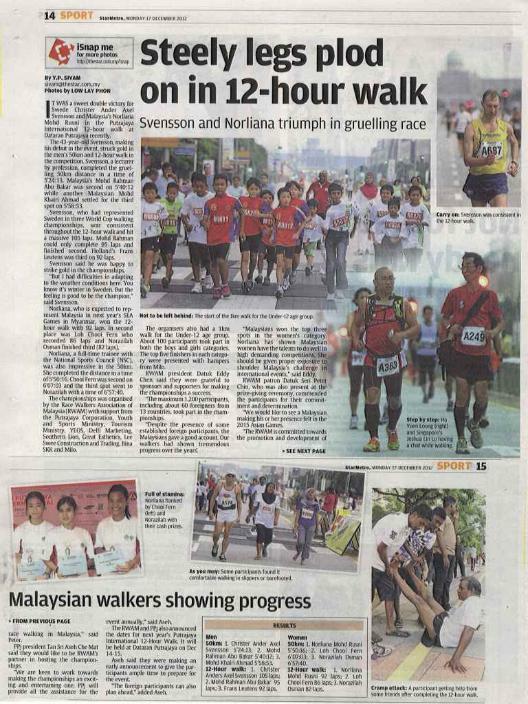 For more information on the 12-hour walk, visit racewalkermalaysia.synthasite.com or email whyap@metrok.com.my. FOR the first time in five years, the 12-hour walk, organised by the Race Walkers Association of Malaysia (RWAM), will be held in Putrajaya on Dec 13 and 14. 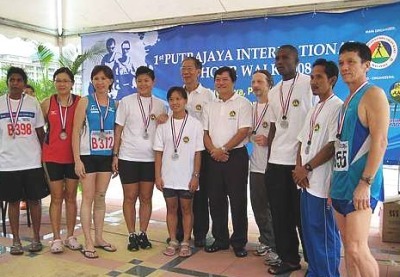 The last four editions of the 12-hour walk was held in Penang. But this year, for a change, the RWAM has opted to stage the event, the Putrajaya International 12-Hour Walk, in Putrajaya. RWAM president Datuk Eddy Chen said the last four editions of the event were successful. “Now we are keen to promote the event in other states as well. We felt Putrajaya will be an interesting venue for the 12-Hour Walk. We have received encouraging response from our partners Putrajaya Holdings and the Federal Territory Amateur Athletics Association. “We have also got in touch with our overseas contacts to promote the event,’’ said Chen. The organisers are expecting about 300 participants to be part of the event. They have already received confirmation from participants in Hong Kong, Singapore, Spain, the Philippines and Belgium. Chen said they were expecting about 85% of participants to be locals. The 12-Hour Walk will have two categories - men and women - and there will be cash prizes for the top 30 who finish in each category. The organisers have also included a 50km event for both men and women in the 12-Hour Walk. Chen said the 50km walk for men was to prepare Malaysian walkers for the 2010 Common-wealth Games in New Delhi. “Our initial plan was to have the 50km walk for men only. But several women were also game for the challenge. 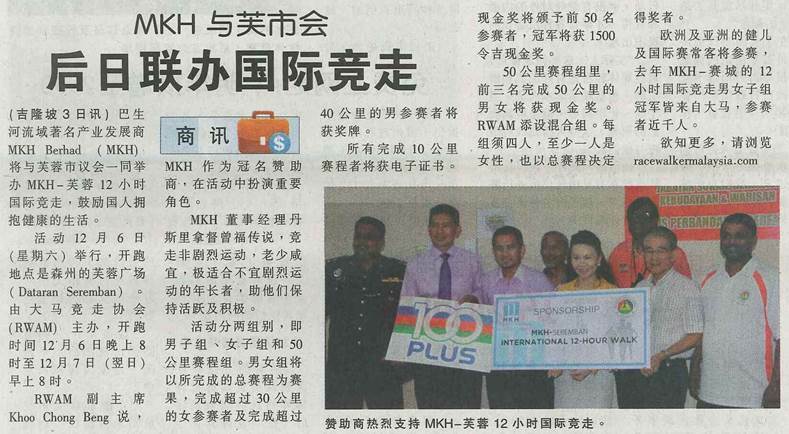 Our main aim is to provide a platform for Malaysian walkers to prepare for the Commonwealth Games,’’ said Chen. In the 1998 Commonwealth Games in Kuala Lumpur, Malaysia won the gold medal in the 50km walk through G. Saravanan. Chen said Saravanan had proved that Malaysians had the talent to match their rivals in the Commonwealth Games. “We did not have any representatives in the 2002 and 2006 Commonwealth Games. We hope to see a Malaysian starting the event in New Delhi,’’ added Chen. For more information visit racewalkermalaysia.synthasite.com/ or e-mail whyap@metrok.com.my.